In most of applications, parts are subject to new requirements in terms of resistance or mechanical capacity. 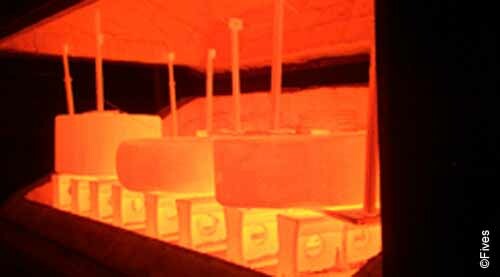 Fives supports manufacturers in high performance heat treat process. The heat treatment industry continues to be very active as it responds to the quality, production, emissions and efficiency demands of the aerospace, automotive, and energy industries. Transporting oil either via pipeline or rail car is forging and heat treating intensive. The industry will see an increase in demand for the full range of heat treating processes, from post-weld heat treatment thruogh the more demanding AMS 2750 E Class I and II specifications. Fives provides a wide range of value added solutions for car bottom and box batch furnaces, muffle furnaces, ovens, mesh belt and roller hearth continuous furnaces, for carburizing, aging, hardening, drawing, and tempering operations. Fives’ combustion systems feature low NOx and CO emissions, high temperature uniformity, high process efficiency, and wide operating ranges. Fives offers high velocity burners, recuperative and self-recuperative burners, North American TwinBed II regenerative systems and a complete line of radiant tube burners. To ensure performance and availability all along the process, Fives offers advanced control systems including Safety PLC-based process control systems. Fives brings a full range of ancillaries systems such as blowers, control valves, and regulators. Fives brings its expertise and services to supply tailor-made solutions and ensure an optimal performance and improved temperature uniformity in the furnace including heating and baseline studies.